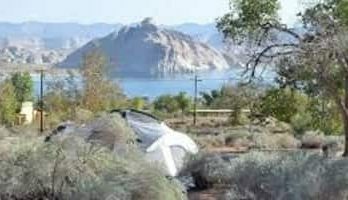 Dry Camping what is Dry Camping and Where Can I Dry Camp? We get asked this question quite a bit because we camp a lot and here is my reply to this question. Dry camping is a way of camping in an RV without hooking up to any utilities. The difference is dry camping can even take place at a developed campground. Where can we dry camp? Almost all National Forest lands are open to camping unless they are otherwise posted. Almost all National Forest lands are open to camping unless they are otherwise posted. 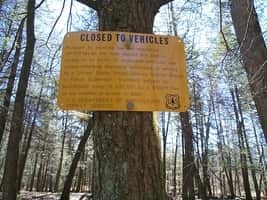 The common sign that the Forest Service will post to close an area says closed to vehicles. When an area is overused, the local rangers will usually close vehicle access to the area. At some common “pull off” camping sites. You will usually find an area large enough to back in your rig up as well as a rock fire ring. Sometimes times you will find trash left behind from those who were there before you. So you should be prepared to do a little cleanup work. Some sites can be completely hidden from the sun by being under the trees. Sometimes backing into these sites can be especially hard as all the trees begin to blend together in the rear view mirrors. 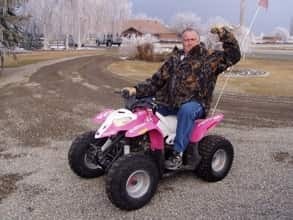 Some people have gotten into the habit of marking the trees they need to steer around with brightly colored objects that will easily be seen in the mirror. Some people even try using a chock but I have even seen lean lynx levelers against the trees as markers. The final positioning of the rig on the site can take a few minutes. Because there are some things to take into consideration that you may not normally think about. Some items to consider also include the slope of the area like (low spots that rainwater will pool in). The level of the area, the direction you want your door to face. There are other things as well like are there any obstructions to the bunks pulling out. While you are checking out the best location for your rig, remember to look up. Standing dead trees and or dead limbs can cause damage if the winds pick up. Most areas will usually have a very common stone fire ring, but you may have to clean it out prior to your using it. If you are planning to cook over this fire, you need to remember to bring a cooking grate. You should never ever leave a fire unattended in the forest! 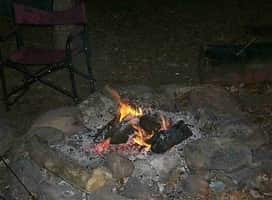 Make sure that it is dead out before you go to bed and or leave the campsite. A shovel for cleaning and maintaining the campfire ring as well as digging gray water holes. Rake this will let you keep the leaves away from the fire ring. 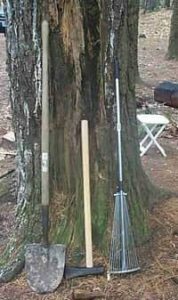 Splitting maul/wedge, or ax as you can collect dead and downed wood for your campfire. A small hand saw can also be very nice to have. In most of the areas, it is considered very poor form to bring a chainsaw or a log splitter. Sometimes it is common for the rangers to leave some wood piled around campsites for campers to use. If you do happen to find a pile like this you will be glad that you brought the splitting maul. Remember do not fill your truck when you leave unless you have a permit to gather wood. The “facilities” that are available at some Campgrounds sometimes will consist of his and her pit toilets. As the name implies, the buildings are situated over large pits where the waste is stored. You should remember that they do not have running water or flushing toilets. I was amazed the first time that I used them at how little odor was present. These are not for the disposal of garbage or anything else other than human waste. 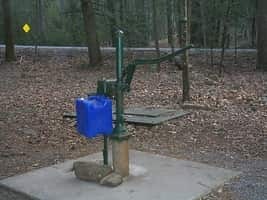 You might see a hand pump at some of the Campgrounds. If so you can use 5 gallon or 7-gallon freshwater bottles and fill your rigs water tank with them. We will sometimes use about (14 or so gallons) per day considering we are using it for cooking, cleaning, showers, and drinking. For years, campers have camped in the woods. One of the things they have always done is cleaned their dishes or themselves. Remember when you are dry camping a dump station for your gray water will not usually be available. We only use biodegradable soap when in the forest for both dishes and personal washing. The “shampoo” and soap from your home that should only be used in campgrounds which have bathhouses and sewer facilities. If you don’t think you are not quite ready for the full dry camping experience. The Forest Service has a lot of wonderfully developed campgrounds which will still classify as dry camping. 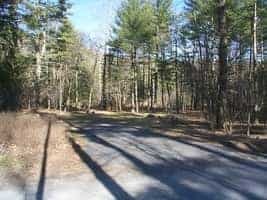 In a developed campground you will usually find a fire ring, a picnic table, and a lantern post. This site is about Boondocking, it is also called Dispersed Camping, Wild Camping, and other names. I have been camping for many years and did not know it was called boondocking. But there are so many beautiful places here in our country that are extremely beautiful so go out and enjoy your own boondocking experience.